It might not be obvious as to why anyone should care about what's happening on the far side of the sun. But NASA can explain: our home star is a seething, roiling ball of superhot gas that goes through cycles of relative quiet, punctuated by violent outbursts. Every so often, the sun spits out a blob of charged subatomic particles  and occasionally, they are aimed directly at Earth. These eruptions, known as coronal mass ejections, aren't big enough to hurt the planet physically; they're very hot but also very insubstantial. What they can do is fry the electronics of communications satellites and even put astronauts in danger of a radiation overdose. These electronic storms are part of a broader phenomenon known as "space weather," and it's good to have as much warning as possible when the sun is looking angry. The problem is that its angry face might be turned away from us, and it takes about 12 days for the far side to rotate into view. That's one major reason that NASA launched the twin STEREO spacecraft (for Solar TErrestrial RElations Observatory) in 2006 to take up positions orbiting on opposite sides of the sun. The satellites constantly image the sun in several wavelengths of light, which come from various layers near the sun's surface, because the sunspots and magnetic storms that generate space weather  just like hurricanes and thunderstorms on Earth  have a three-dimensional structure. 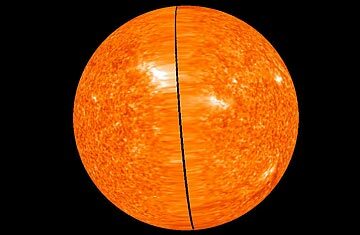 To celebrate, NASA released an image of the far side of the sun, showing our star in all its glory, and even a movie showing what you'd see if you could zip around the entire sun. And for the record, the space-weather forecast doesn't include any storms on the interplanetary horizon. See more about the sun's flare-up of activity.